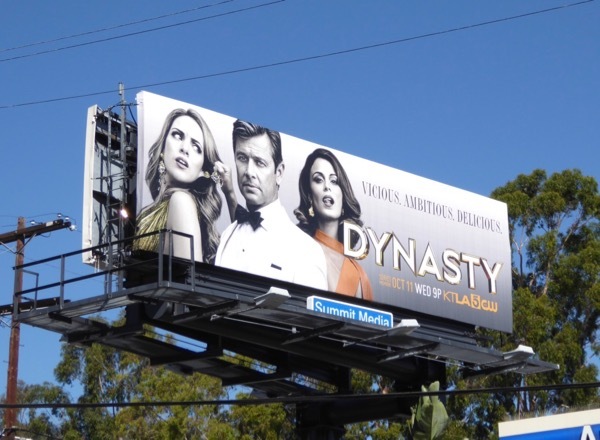 In 2012 TNT tried to revive legendary soap Dallas with a mix of old and new characters, an undertaking which lasted for three seasons. 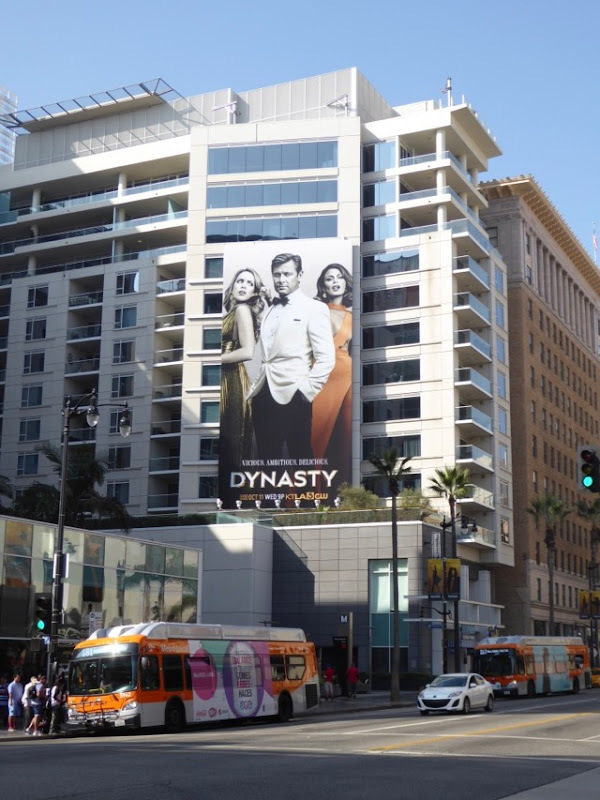 This TV season it's the turn of another iconic 1980s soap, Dynasty, to get a remake for a new generation. 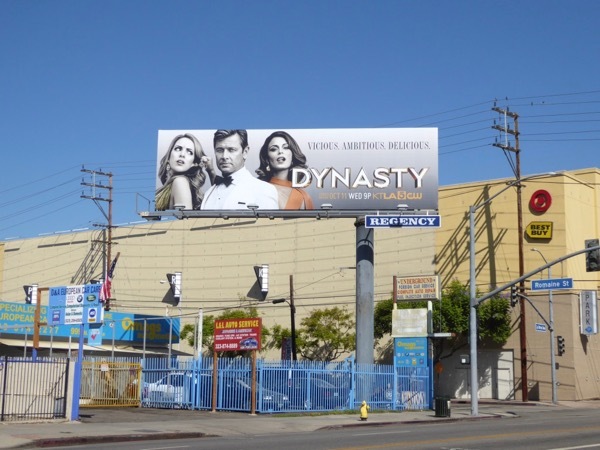 The original series ran from 1981 to 1989 and followed the exploits of warring clans, the 'Carringtons' and the 'Colbys', old versus new money. Over the course of the seasons there were backstabbing schemes, catfights, comas, pregnancies, affairs, alien abductions, wedding massacres and most importantly, Joan Collins as 'Blake Carrington's' ex-wife 'Alexis'. 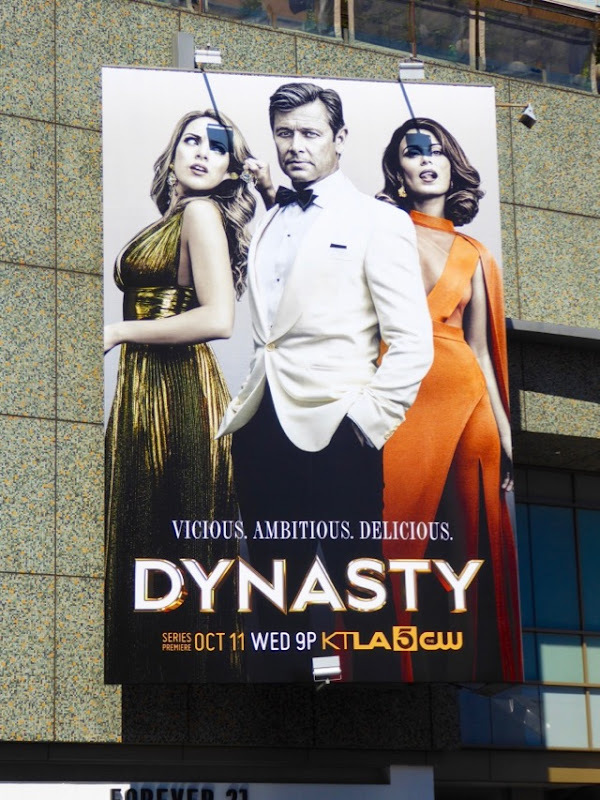 In The CW's rebooted series the action moves from Denver to Atlanta, and the drama comes when Blake Carrington's (Grant Show) ambitious young fiancée 'Cristal' (Nathalie Kelley) clashes with his driven daughter 'Fallon' (Elizabeth Gillies) over the love of the family's patriarch and control of Carrington Atlantic global energy company. 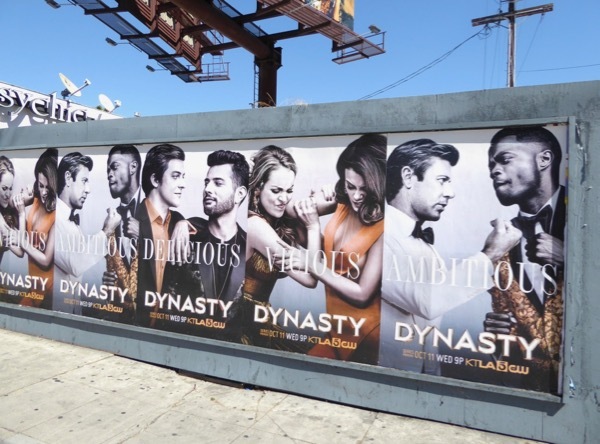 More campy drama will come from the now African-American Colbys, liberal gay sons with differing political views and mysterious nephews jumping into beds and causing trouble. You can't choose your family, but at least there's never a dull moment when they are around. 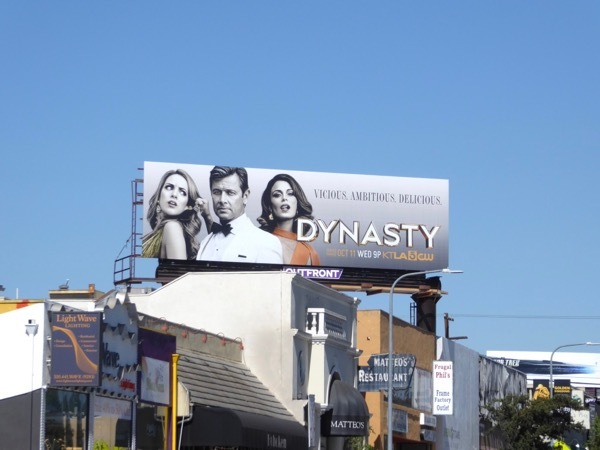 These series launch billboards and streets posters for the Dynasty remake were photographed along Sunset Boulevard, La Brea Avenue, Westwood Boulevard, Hollywood Boulevard, La Cienega Boulevard and Pico Boulevard from September 22 to September 28, 2017. 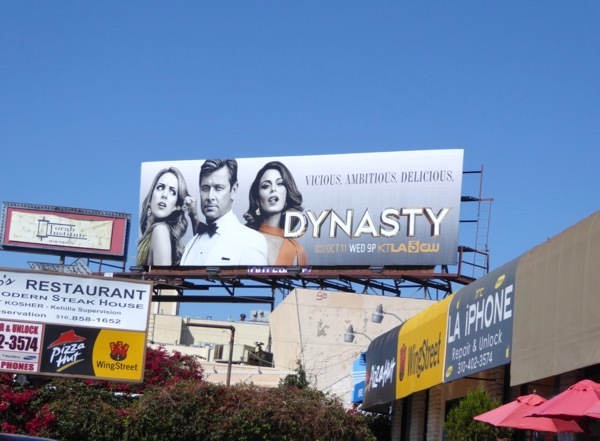 Plus be sure to also compare them to these Dallas TV revival billboards from 2012. 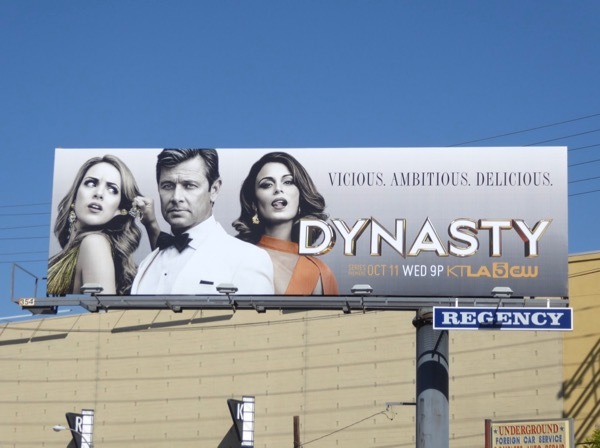 Let's see if this vicious, ambitious and delicious reinvention of Dynasty will live up to the family name, or if the nostalgic reboot fails whether the new drama will simply be thrown from a balcony like some fantastical abandoned plot line. 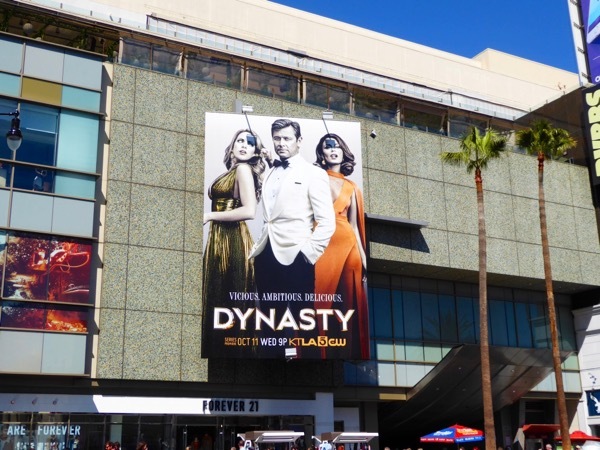 UPDATED: Here's another portrait billboard for the show spotted at Hollywood & Vine on October 13, 2017. 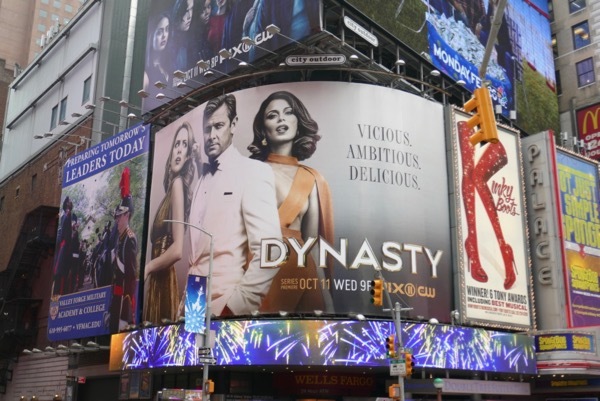 UPDATED: In addition here's a billboard for the soapy drama in Manhattan's Times Square on February 15, 2018.